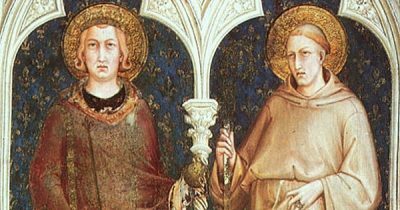 August 13 - Saints Pontian, Pope, and Hippolytus, Priest, Martyrs - Optional Memorial - My Catholic Life! Today’s martyrs died on the island of Sardinia, perhaps from overwork in the mines or from starvation or neglect rather than execution. In a pacific interlude following the persecution which was their doom, Pope Fabian returned their bodies to Rome for dignified burial. Pontian was interred in the papal crypt in the catacombs of Callixtus near so many of his fellow popes of the 200s. In 1909 the original marble epitaph on Pontian’s tomb was picked up out of the rubble littering the floor of the catacombs. It reads PONTIANUS EPISK MPT. Pontian Bishop Martyr. Tombstones are very economical. Hippolytus was buried in a Roman catacomb, subsequently named in his honor, which became a pilgrimage site. Little links today’s martyrs except their common date of burial, August 13th, and their place of death. Hippolytus is by far the more significant figure. Pope Saint Pontian was consecrated Bishop of Rome in 230. He is chiefly known for convening a Roman synod which confirmed a prior condemnation of the Egyptian theologian Origen. Like so many other bishops of his era, Pontian also dealt with the divergent opinions in the Church over how to respond to Christians who had abjured their faith during a persecution. Should they be re-baptized, do public penance, or be welcomed back privately? Tensions over this issue perdured for many decades and deeply wounded Church unity. During the persecution of Emperor Maximinus, Pontian was exiled, after first willingly resigning in 235 so that a successor could be elected. For this magnanimous act, he was remembered as “distinguished” in contemporary documents. Saint Hippolytus is an elusive figure. He was most likely from Rome, although some traditions state he was from Lyon, and was a disciple of Saint Irenaeus. Incredibly, for a saint, Hippolytus is traditionally also labeled an anti-pope for resisting Pope Callixtus’ lenient attitude in reintegrating to Church life the lapsi who had rendered homage to false gods. Hippolytus was later reconciled to the Church which he loved enough to disrupt. Besides being a controversialist, Hippolytus was the most impactful theologian of the Roman Church before Christianity’s legalization in 313. Most of his writings have been lost, but enough translated fragments of his original Greek works survive to signal his importance. He wrote on Scripture, dogma, law, apologetics, Christ, and also authored a comprehensive polemical work entitled A Refutation of All Heresies. Hippolytus is most famous as the author of the Apostolic Tradition, a work which preserves some of the most ancient liturgical texts of the primitive church. The original of the Apostolic Tradition does not exist, and later translated fragments are of dubious provenance, making the work a fluid, composite text of different eras. Nevertheless, at its core it is a one-of-a-kind artifact, which allows a modern Christian to peek through the keyhole of the church door at the liturgy of the early, praying Church. Hippolytus doesn’t just describe the liturgy, as the earlier Didache and Saint Justin Martyr do. He commits to writing the actual prayers as he remembers them. The Apostolic Tradition contains the earliest known rite of ordination, with the same words being used in the ordination rite of a bishop today by the Catholic Church. Hippolytus provides the first example of the Virgin Mary being invoked in liturgical prayer. And Hippolytus’ prayers for the Eucharistic banquet include the third century words of consecration! This text is the source for a significant portion of today’s Eucharistic Prayer II, the most commonly used Eucharistic prayer at Sunday Mass. The familiar ebb and flow of the words of this prayer are heard by many millions of Catholics throughout the world each Sunday. The faithful are hearing a remote echo of third century voices, preserved by Saint Hippolytus. Saints Hippolytus and Pontian, you lived at a difficult but formative time for the Church, and gave such public witness that you were exiled when many others were not. Your headship of the Church led to your demise. You were isolated, suffered want, and died as a result. May we count our own hardships little in light of yours.